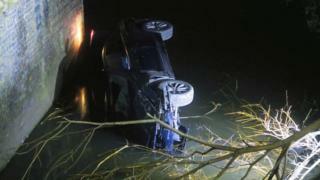 A car carrying four people plunged into a canal following a police chase. Officers tried to stop a BMW in Vaughan Way, Leicester, on Friday evening but it later smashed through a fence and entered the Grand Union Canal. Four people were taken to hospital, where one currently remains. Her injuries are not thought to be serious. Three men, aged 28, 24 and 23, and a 23-year-old woman have been arrested on suspicion of failing to stop and theft of a motor vehicle. Leicestershire Police said initial enquiries suggest the car had been stolen from the Metropolitan Police force area.